Ferretti was founded in 1968. Ferretti Yachts, a fundamental part of the international Ferretti Group holding, which comprises the world's most prestigious yacht brands, is now a large company that is undergoing a process of continuous development and expansion. By 2004 Ferretti Yachts yearly sales had reached 160 million Euro, with state-of-the-art shipyards and a 500-strong staff. 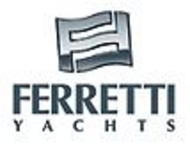 All this gives Ferretti Yachts a world leadership position in the motoryachts sector. The Ferretti 460 is another great success from the proven collaboration between the Ferretti Group Engineering Division and Studio Zuccon International Project. Entry boat of the Ferretti Yachts range, 14.35 meters long, it balances size, performance and comfort perfectly. The compact dimensions, 16 meters long and almost 5 meters wide, allow the 510 to deliver grand Italian luxury and cruising immersed in such comfort until now unheard of in a yacht of this size. There are three revolutionary innovations: the full beam master cabin with chaise longue and two large open view windows that make it a real suite at sea level bathed in light, tones and the natural essences of teak. The internal furnishings are paneled with opaque oak while the galley and the floor of the bathrooms are embellished with wengè trimmings. Thanks to the new design there is even space for a dinette with a table and a surprisingly large sofa for a yacht of this size. The salon offers the guests every comfort and the master cabin contains a spacious double wardrobe. The Ferretti 592 is an 18-meter fly bridge yacht designed to replace the 591. It includes a series of important modifications that revolutionize the quality of life on board. First of all the glass surface area has been increased to give an almost continuous coverage. A sharp and extremely aggressive external line with an innovative spherical window that extends from aft to the bow giving 360° visibility of the sea. The large open view window in the master cabin is fundamental for optimizing space and gives the 630 the feel of a much larger yacht. Elegance and versatility characterize the sofas and tables on the fly bridge. Compared to the previous 680 the first impression is that this is a completely new yacht. Space, comfort and a completely contemporary design, the use of teak and a newly designed line, make this a perfect yacht for its size and optimization of space. The large master cabin takes advantage of the most important Ferretti innovations in terms of space and luminosity: with a large open view window on either side that allow a view of the sea from the ample bathroom equipped with a semi-circular shower and toilet, separated by a sliding door. The Ferretti 830 was the first yacht of the Ferretti range to have the new open view window in the master cabin that ensures a completely unique view of the sea both from the bed, facing the window, and from the bathroom, with two communicating sections. The new Ferretti 881, flagship of the Ferretti Yachts range, follows the huge success of the 880. Designed with those who wish to cruise in luxury without giving up the atmosphere synonymous with a double F yacht in mind, and planned according to the most rigorous Ferretti family feeling. The new layout maintains the structural excellence of the original yacht, with the addition of an upper deck containing a pilot house that dominates the sea. The internal environment respects the innovative solutions introduced on the Ferretti Yachts flagship which inspired the 881 RPH. The new Altura Line comes from the experience and the history gained by the Ferretti shipyards. The Altura 690 is a brand new AFT Cabin motor yacht which unites over thirty five years of technological innovation, research and experimentation with a successful philosophy that has left an indelible mark on the nautical world.